This project was built by a private trust fully in accordance with the philanthropic tradition of almshouses begun in the 17th century. 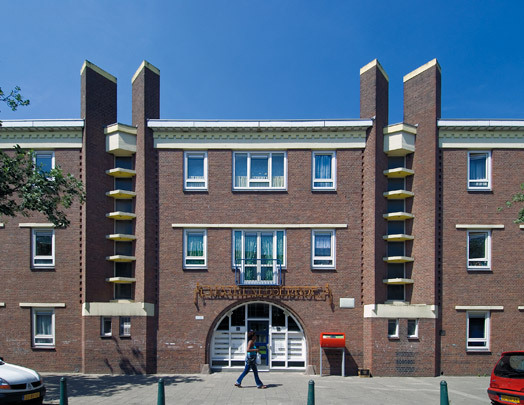 The ensemble, a square block of dwellings with a courtyard at its centre, is reached through a gateway in Mathenesserstraat. The two stairwells flanking the gateway are expressed in the facade. All units are accessed from the courtyard along roofed arcades. The arcade serving the ground-floor units has semicircular openings; these are larger and oblong on the two upper floors. Mathenesserhof was renovated in 1990, when the 56 not exactly roomy dwellings were converted into 31 units for the elderly.